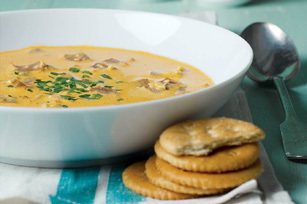 This deliciously creamy and garlicky soup gets its Spanish influence from pimenton (Spanish paprika) and smoked ham. Heat oil in large saucepan on medium-high heat. Add ham and garlic; cook 1 to 2 min. or until garlic is golden brown, stirring constantly. Add paprika and cumin; cook and stir 1 min. or just until seasonings are toasted. Stir in cream cheese; cook and stir 1 to 2 min. or until cream cheese is melted and mixture is well blended. Add broth; stir. Bring to boil; simmer on medium-low heat 5 min, stirring frequently. Serve with crackers. Save 40 calories and 5g of fat, including 3g of sat fat, per serving by preparing with PHILADELPHIA Neufchatel Cheese and RITZ Reduced Fat Crackers. Pimentón is a unique spice made from spicy red peppers that have been harvested and smoke-dried with oak wood, which gives the pimentón its smoky flavor. Pimentón comes in three varieties: sweet and mild (dulce); bittersweet medium hot (agridulce) and hot (picante). The level of spiciness is up to you! Pimentón can be stored in a cool dry place for up to 2 years. Though a distant cousin of Hungarian paprika, pimentón has no good substitute for use in authentic Spanish cooking. Fresh garlic is available year round. Purchase firm, plump bulbs with dry skins. Avoid garlic stored in the refrigerated section of the produce department. Store garlic in an open container in a cool, dark place.